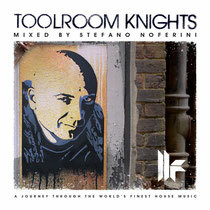 One of Italy’s most respected DJs, Stefano Noferini, turns his hand to the ‘Toolroom Knights’ series. Including three exclusive productions from Stefano himself, plus featuring unheard tracks and classic tunes alike from the kingpins of the tech scene such as UMEK, Christian Smith, Pirupa & Hollen, DJ PP, Boris Ross & Jeff Moore, Technasia and many more, ‘Toolroom Knights Mixed By Stefano Noferini’ is a great snapshot of the Italian master’s ability to build a mix brimming with driving energy. Showcasing his mixing prowess and knowledge of music via an fine track selection, the Italian glides through a showcase of ‘Stefano-approved’ tech house. Highlights include Winx vs. Nic Fanciulli’s revamp of classic cut ‘Don’t Laugh’, rolling driver ‘Let’s Go’ from UMEK, Orkestrated’s ‘Donald Trumpet’ switching up the mix with its chunky driving minimal beats, and Toolroom favourite ‘La Luna’ from DJ PP injecting an infectious groove. Crammed with 19 of the biggest tech house and techno tracks, it’s out now.